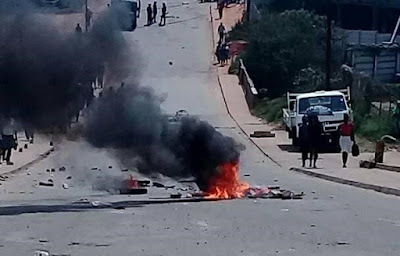 Police in Swaziland turned the city of Manzini into a ‘battlefield’ and ‘warzone’ on the second day of the national strike in the kingdom. The Swazi Observer, a newspaper in effect owned by King Mswati III, the kingdom’s absolute monarch, said the bus rank in Swaziland’s major commercial city was ‘turned into a warzone as stun grenades, teargas, teasers and rubber bullets became the order of the day’. 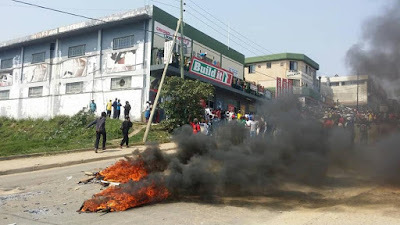 It happened on Wednesday (19 September 2019) as workers across Swaziland continued their protests against poor pay and other working conditions. They are on a three-day stoppage coordinated by the Trade Union Congress of Swaziland (TUCOSWA). The Observer, one of only two daily newspapers in Swaziland (recently renamed Eswatini by the King) where the media are heavily censored, said the bus rank was a ‘serious battlefield’ for more than four hours as armed police and other state forces and workers ‘engaged in fierce confrontation’. The Times of Swaziland reported police threw explosive grenades and fired tear gas canisters at the protestors. 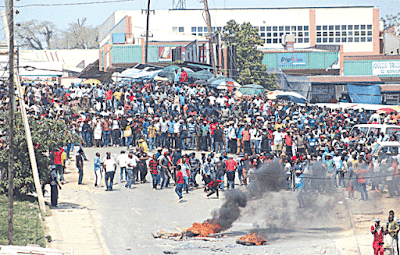 It added, ‘Efforts by the police to chase away onlookers proved futile as the public made it clear that they are not going anywhere until the strike is over and the kombis [buses] were back at the bus rank. The Observer reported, ‘As early as 7 am, police officers and warders were sweeping the streets of Manzini, insulting and threatening to beat up anyone who was wearing a red T-shirt. It added, ‘Police tried firing stun grenades and teargas at the protesting workers who were marching towards the Manzini bus rank. In that moment, a police officer threw a stun grenade at kombi conductors who had mingled with protesting workers. 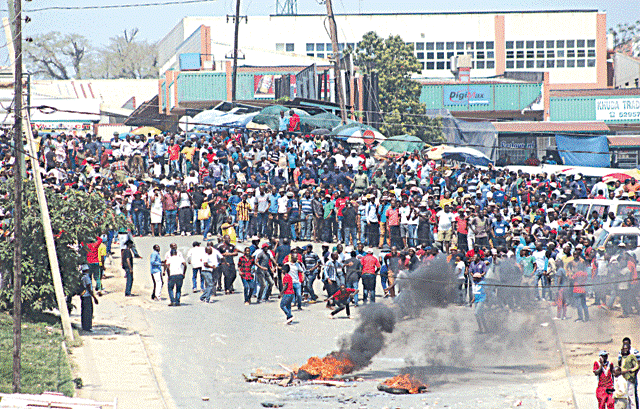 Protests have been taking place in more major towns and cities, including Mbabane, Manzini, Nhlangano and Siteki. Armed police were deployed in Siteki as early as 8 am and union leaders who were known to the police were barred from entering the small town. The Observer added, ‘Meanwhile, members of the public were also barred from entering the Siteki Park as it was used as a meeting point by protesters.’ Most schools in Siteki remained closed. Swaziland holds its national election on Friday (21 September 2018). Political parties are banned from taking part. People are only allowed to elect 59 members of the House of Assembly; the King appoints a further 10. No members of the 30-strong Swazi Senate are elected by the people. The King chooses the Prime Minister and Cabinet members. He also chooses top civil servants and judges.